Better technologies have evened the odds when it comes to making the decision to undergo LASIK (laser-assisted in situ keratomileusis) surgery instead of a lifetime of using contact lenses, according to the results from recent studies. This goes against most people’s assumptions about the safety of contact use. Wearing contacts has generally been promoted as a safe way to correct vision problems. By placing a moist contact on the pupil of each eye, both nearsightedness and farsightedness can be remedied. Contact users are given a few basic instructions about the use of these small vision aids and the rest is supposed to take care of itself. However, many contact users neglect to care properly for their eyes—partly because it is a daily routine that must be followed. Some forget to take out their contacts before sleeping, leaving them in all night long. Others use tap water to moisten and store their contact lenses overnight—which can also lead to bacterial growth. And then there is the problem of wearing contacts for longer periods than intended. All of this can increase a person’s risk for a bacterial infection. These infections are more common than you think. One out of every 100 contact wearers is at risk of developing a serious eye infection. The most common type of infection to attack the eyes preys on the lens and can trigger vision loss. Another type of disease that can crop up in those who wear contacts over the course of a lifetime is keratitis. This risk is lower than that for common infections—about one in 1,000—but the disease also causes vision loss. Sometimes an eye becomes so damaged by an infection that it has to be removed. Compared to the risks involved with contact use, LASIK surgery seems to be no worse—which may not sound very comforting, but it does debunk the myth that the specialized surgery is way more dangerous than sticking with contacts. About one in 1,250 people are at risk from suffering complications due to LASIK surgery. In the past, many who had the surgery performed suffered from problems with their night vision and peripheral vision. However, new technologies have cleared up some of these side effects. Refractive surgery is now used to perform LASIK surgery. Refractive surgery works in much the same way as a refractive telescope—both are intended to improve the ability of your eye to focus on objects. LASIK surgery attempts to reshape the cornea—the part of your eye that directs light towards the retina—to produce clear, sharp vision. New eye-tracking technology adjusts for involuntary eye movements that can affect the outcome of the surgery. And studies suggest that LASIK has become a safer option for many because doctors are better trained and more skilled at performing the surgery. Problems still remain for some people, of course, but evidence is showing that even symptoms such as nighttime glare can dissipate after a few months of healing and adapting post-surgery. One final note: the cost of LASIK surgery is about $2,150 per eye. The cost of a year’s supply of continuous wear contacts is around $275, so cost will definitely factor into your decision to get laser eye surgery or not. But when looking at just the health effects, the science has shown that LASIK surgery doesn’t have to be as scary as it seems. 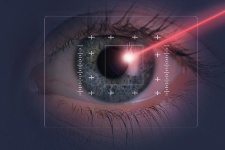 “Laser Eye Surgery for Vision Correction,” Health Canada web site, http://www.hc-sc.gc.ca/hl-vs/iyh-vsv/med/surgery-chirurgie-eng.php, last accessed May 14, 2013. Ackermann, R., et al., “Optical side-effects of fs-laser treatment in refractive surgery investigated by means of a model eye,” Biomed Opt Express. February 1, 2013; 4(2): 220-9. Mathers, M.D., et al., “Risk of Lasik Surgery vs Contact Lenses,” Arch Ophthalmol 2006; 124(10): 1510-1511. “Lasik vs Contact Lenses,” Casey Eye Institute web site, http://www.ohsu.edu/xd/health/services/casey-eye/clinical-services/laser-vision-correction/lasikvscontacts.cfm, last accessed May 13, 2013.